Dealing with random pimples or constant acne is tough but trying to get rid of the dark marks that they leave behind, is even worse. I’ve been trying to get rid of the marks that were left behind from my breakouts over the past year and it hasn’t been easy. I tried a ton of products and spent a lot of money and most of the time, I received no results whatsoever. Luckily, I found a routine that is working for me, so I thought I’d share some of my tips with you guys. So, here goes.. If you are not exfoliating your skin on a regular basis then may I ask, what in the world is wrong with you?? 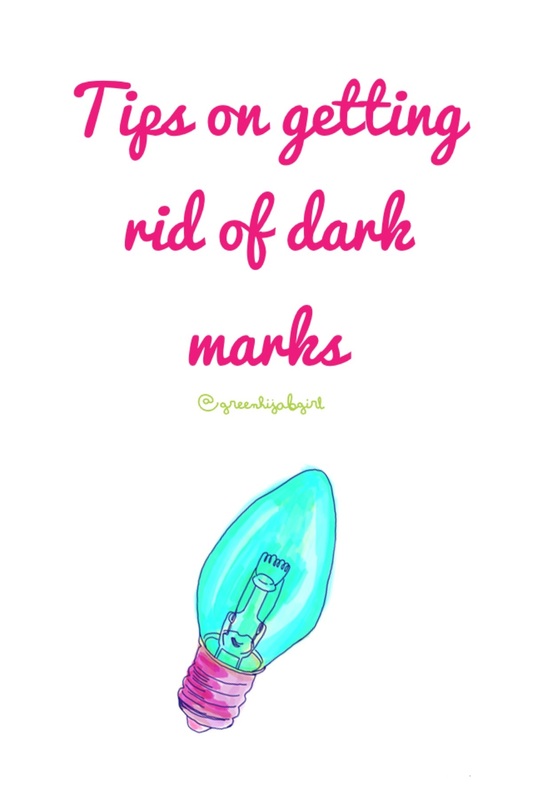 If you have dark marks, you need to exfoliate. It is honestly that simple. Exfoliating removes all of the dead facial skin cells which will reveal skin that is brighter and fresher. The roughish granules also aid in decongesting clogged pores and improves your skin texture. If you are looking for a great exfoliater, I’m currently using the Apricot and Walnut Facial Polish Exfoliator from The Victorian Garden, which I love and which you can read more about here and purchase here. And remember, you should only be exfoliating, at most, 3 times a week. Any more than that and you’ll probably end up with very thin, dry and flaky skin. Sunblock is so important, not only for preventing your skin from the harmful rays of the sun that may cause sun damage and skin cancer but also from the darkening effects that the sun can have on your already dark marks. You should be using a sunblock with an SPF of at least 30 and you should be applying it on the hour, every hour. If you are one of those people that only apply their sunblock in the morning and never ever reapply during the day, you aren’t helping yourself. What’s the point of trying everything possible to get rid of your marks when you negate all of your hard work by allowing the sun to take its toll on your skin? It just isn’t feasible and pretty much nonsensical. Just pop your sunblock in your bag after you’ve applied it in the morning and that way you can apply it throughout the day, its not that difficult! There are a ton of great sunblocks out there to suit everyone’s needs and budgets, so it won’t be hard finding the right one for you. I’m currently using the Oil-Free Matte Block from Dermalogica which retails for about R570 for a 50ml bottle, which is quite pricey but it’s the only sunblock that I really enjoy using so I don’t mind paying so much. Masks can be totally worthwhile if you choose the correct one. When shopping for a face mask always check out the ingredients as you want a mask that’s going to aid you in your battle against the dark marks. So always look out for the key ingredients such as Lemon, Aloe Vera, Bearberry, Sandalwood and Rosehip Oil, amongst others, as these are great at reducing dark marks. However, if you spot Hydroquinone in the ingredients list of the mask, or any other product for that matter, place the product back on the shelf and back away slowly. Hydroquinone is one of those ingredients that are super dodge and that you would want to stay far away from. You could also make your own face mask at home, if you’d like to go the natural way. Tomatoes, strawberries, avocados, kiwis, lemons and potatoes are really great at reducing dark marks whilst increasing the skin’s renewal process, so you might want to try them out. I’ve been using The 7 Herb Firming Clay Masque from The Victorian Garden which is wonderful and minty too, I’ll be doing a review really soon but until then you can check it out here. Whether you have oily, sensitive, dry or acne prone skin facial oi will work amazingly for you. Facial oils are great for rehydrating and nourishing the skin, reducing pore size, promoting skin rejuvenation, reducing dark marks and combatting acne – you’ve just got to find the one that works for you. However, if you have acne prone skin, stay away from those facial oils with a high content of Rosehip oil unless you are trying to induce a breakout because that is exactly what an overload of Rosehip Oil will do. Facial oils are quite easy to use, I usually apply about 3 drops at night to my face and neck and allow it to absorb into my skin before hitting the pillow. If 2 drops can cover your whole face then good for you because the less oil applied the better. Remember not to use more than 3 drops per night or you might wake up with very red, blotchy and itchy skin. Not fun at all. I’ve been using the Lavender and Myrrh Facial Healing Oil from The Victorian Garden for about 4 months now. I did use it previously between January and March of this year and received wonderful results and then I stupidly stopped using it because I thought I would get faster results from another brand and basically that blew up in my face, or rather on it? Anywho, I’m back to TVG’s healing oil now and that’s all that matters. You can purchase it here and read more about my experience with it here. Try not to think about the marks. I know it’s easier said than done, I’m in your position too, but just try. Pretend that they don’t exist or at least that they are getting lighter. If you believe that the marks are getting lighter, you are less likely to give in to wanting to try out other products. And you know just how important it is to give the products that you use a chance to work their magic on your skin. No product works overnight, they each need about 3-6 months to prove their worth to you – so hang in there, it will work for you, I promise! If in the unfortunate event that nothing ever works for you, I would suggest making an appointment with your dermatologist or consulting a skin clinic about the possibility of performing a skin peel (which is not as scary as it sounds!). Whatever you do, be smart about it. Don’t use cheap, non-dermatologically tested products on your skin or try weird things, you already have dark marks I really don’t think you want to make it any worse. Also, don’t let these marks kill your self-confidence. You are still beautiful regardless of those marks and besides the opinion and view that you have of yourself, is the only thing that matters!